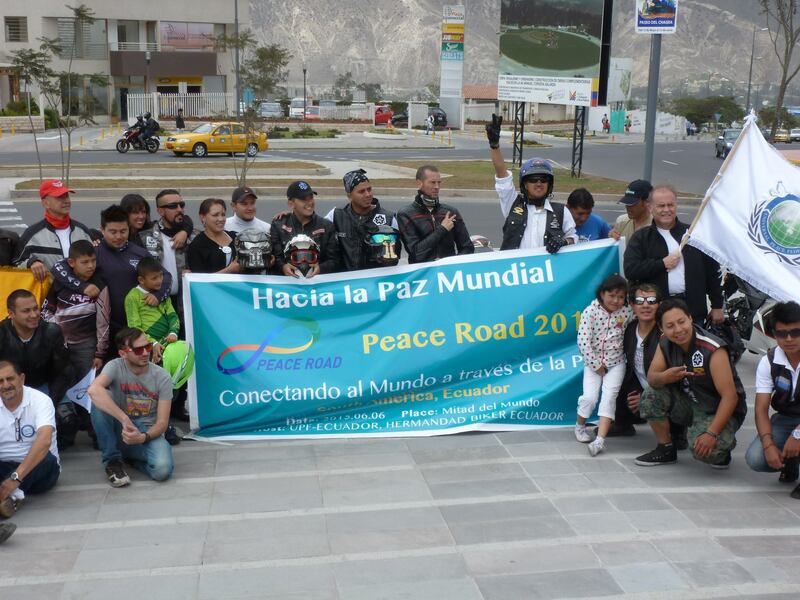 UPF Ecuador: On June 6 the Peace Road 2015 lunched in Ecuador, which was the fourth nation in South America. With the big support from Ambassadors for Peace in Ecuador, 60 people participated. One of Motorcycle club’s President, who is a friend of one of our Ambassador for Peace, brought his club to join the Peace Road 2015. He showed interest in our projects: Peace Road and International Highway as well the Character Education of UPF. So we included the short lecture of Character Education at the end of event which was given by a university student, a member of UPF-Ecuador. Because of the participation of the motorcycle club, we changed the plan from 5km parade to 27km of motorcycle ride. And because of the social situation of Ecuador, we could not have the support of police office in this time. Instead our Ambassadors for peace supported from the beginning of plan to the end of the event willingly. Thanks everyone for the great support.